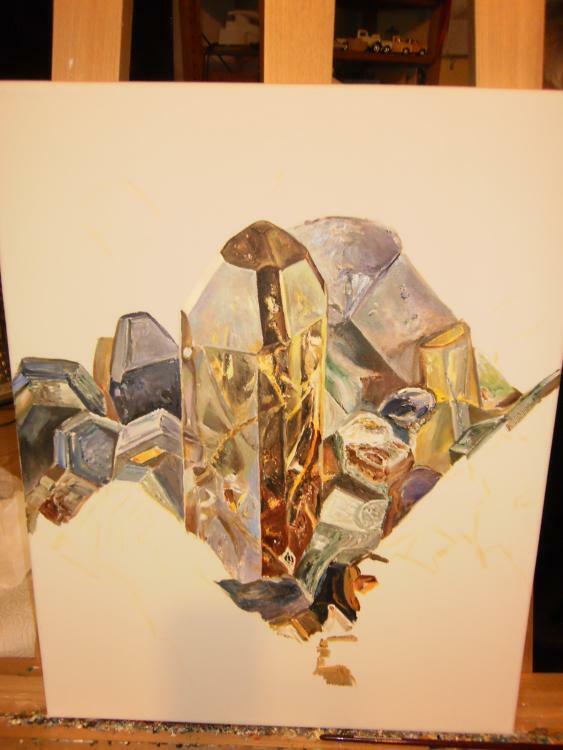 FMF - Friends of Minerals Forum, discussion and message board :: View topic - 2013 Paint Off!!! Posted: Jan 05, 2013 04:40 Post subject: 2013 Paint Off!!! Well the weather eased off a bit today with the temperature in the mid 20s so I was able to complete my version of the vesuvianite. I will post a set of three progress pictures shortly. Oh, and thanks Ploum for agreeing to its use. Posted: Jan 05, 2013 04:50 Post subject: Re: 2013 Paint Off!!! 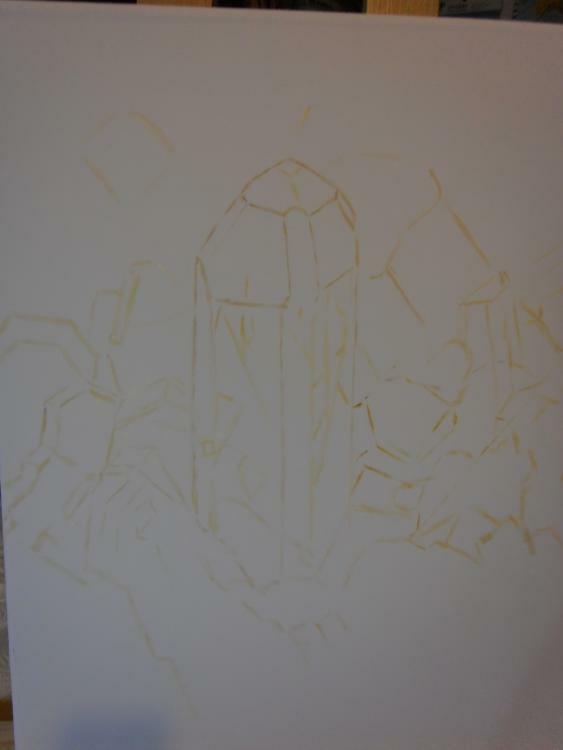 Here's the start of the painting. I take the original image and crop it to what I want to see. I then print out a copy and use transfer paper to transfer the outline on to the black card. 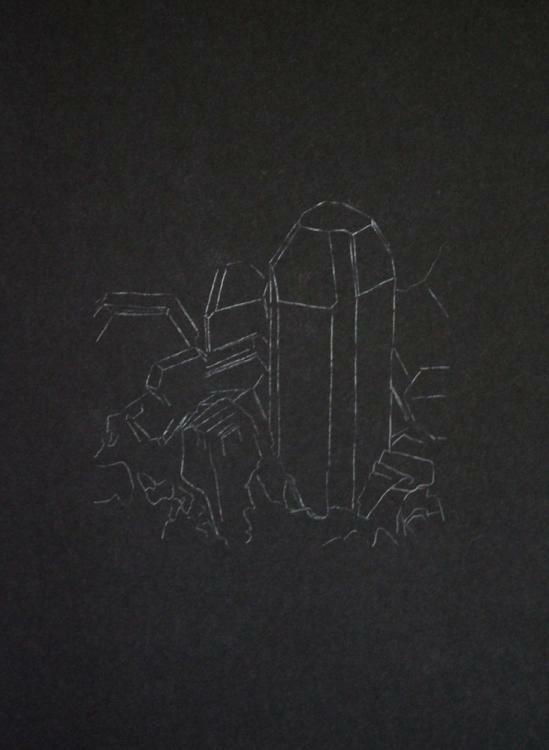 I do this not because I can't draw, but because mineral specimen angles and proportions are not forgiving. You only have to be a little bit out, and it just does not look right. Posted: Jan 05, 2013 04:54 Post subject: Re: 2013 Paint Off!!! 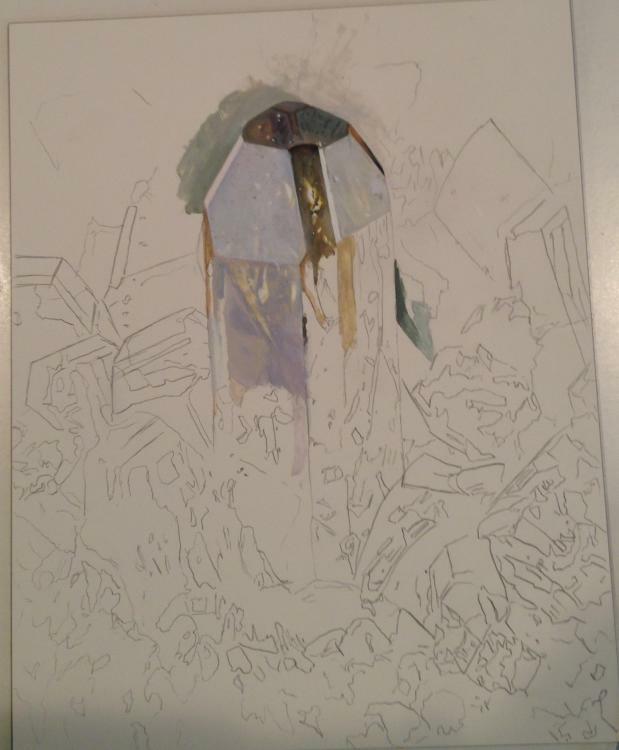 Now I am a fair way through with most areas blocked out and some highlights added. It's at this stage where you look at it and wonder if it is actually going to work. You have doubts. One of the problems that I face in particular with my technique is that some pigments just get sucked right into the black card. This is particularly true for many yellow tints. They tend to look way too green. Posted: Jan 05, 2013 05:00 Post subject: Re: 2013 Paint Off!!! Extra washes and highlights added to give the painting depth and three-dimensionality. You know when you are done when you start fiddling. That is the time to STOP! Final painting below. Painted using water-mixable oils on black card. 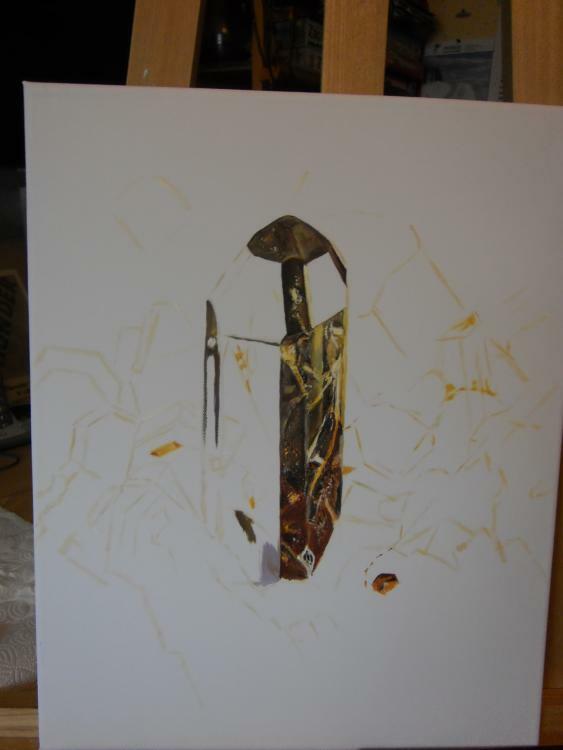 The actual height of the main crystal in the painting is 17cm. The card is A2 size (59.4x42cm or 23.4x16.5") and orientated in portrait mode. Time to complete, less than half a day. Posted: Jan 05, 2013 05:03 Post subject: Re: 2013 Paint Off!!! So does it look like a copy of the photo? A little. Is it supposed to? No. You already have a photograph. 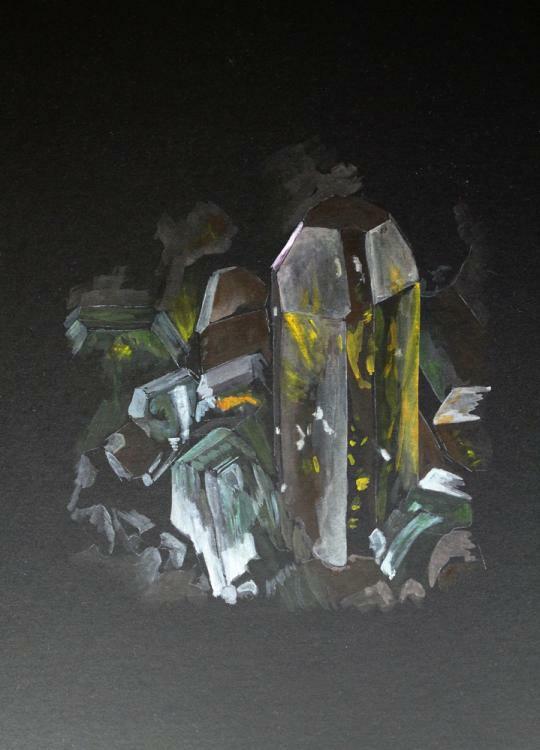 Does it look like vesuvianite? I think so. Am I happy with it? Absolutely! Posted: Jan 05, 2013 05:28 Post subject: Re: 2013 Paint Off!!! I am very happy to see your painting. It looks wonderful. You used the photo, like I always do, only as an aid. A copy is never the aim, than an artist work. 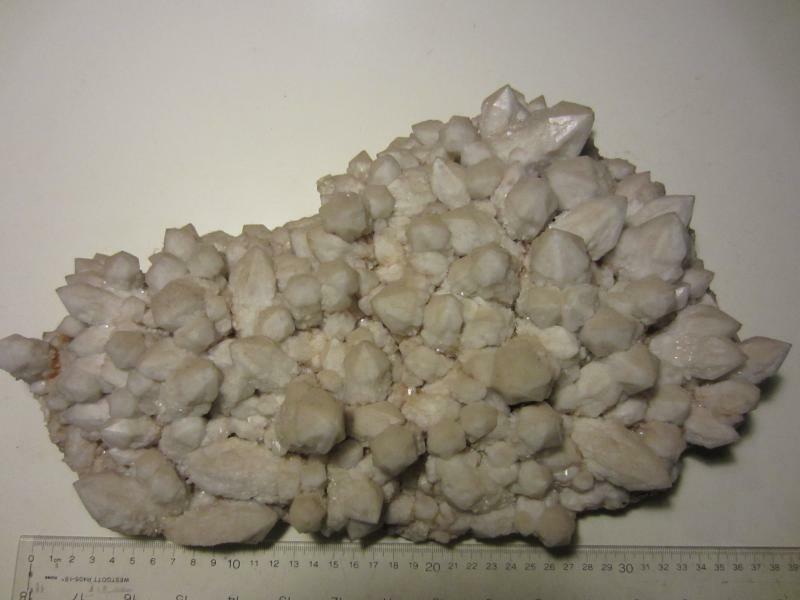 I am glad to find so much perfect photos here in the FMF-gallery and also in the Mineralatlas. But they are photos and they dare me to do a painting, not a photo copy. Once more: Steve, you did a phantastic art paint, it's perfect (I smiled, when I read the problems while painting, because I had the same - I worked with other materials before). So I will start working, as soon as possible. Posted: Jan 05, 2013 05:32 Post subject: Re: 2013 Paint Off!!! Posted: Jan 05, 2013 06:22 Post subject: Re: 2013 Paint Off!!! you can call me Brunhild, my family name is Schwertner. Posted: Jan 05, 2013 06:30 Post subject: Re: 2013 Paint Off!!! From now on I will. Sorry Brunhild, I did not know. Posted: Jan 05, 2013 07:20 Post subject: Re: 2013 Paint Off!!! Posted: Jan 05, 2013 18:10 Post subject: Re: 2013 Paint Off!!! I like your representation, Steve! It will take me quite a bit of time with my style since I tend to reproduce detail-for-detail. That and limited time now that I'm back to work and classes. But I'm excited to start the preparations tonight! I'm going to use this challenge as an opportunity to use my 8x10 clayboard. Posted: Jan 05, 2013 18:21 Post subject: Re: 2013 Paint Off!!! 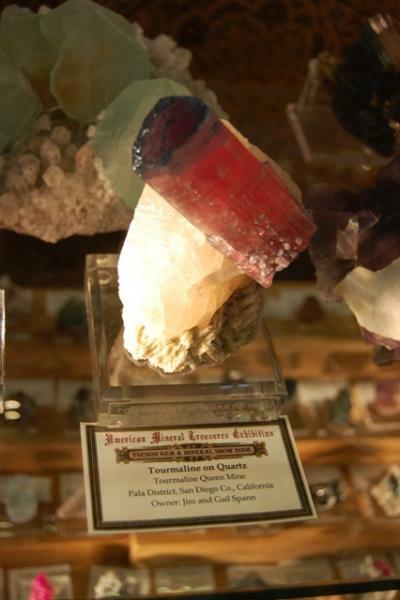 I wanted to add that I find it fascinating that you can take a mineral originally photographed in a bright environment and represent it as if it were coming out of the dark like someone has lit a candle in a mine. It looks as though it could have been originally photographed with the black background. Posted: Jan 05, 2013 19:25 Post subject: Re: 2013 Paint Off!!! Thanks Ed. I hadn't thought about it that way before. Interesting concept! I had to get mine done as I won't be able to paint for a couple of weeks. I won't even be able to use the computer for a few days from Thursday on. Good luck with yours. Brunhild too. Posted: Jan 06, 2013 04:41 Post subject: Re: 2013 Paint Off!!! Ed, I wish you good working time also. Posted: Jan 07, 2013 05:27 Post subject: Re: 2013 Paint Off!!! As I painted about 9 hours yesterday, I show the result. During painting I often was blinded by the lights in the photo. I really could empathize, as if I were standing like a midget in a wonderworld. Finally I had to decide, which detail shall I paint and which not. It was a rewarding hard work. Posted: Jan 07, 2013 05:58 Post subject: Re: 2013 Paint Off!!! Wow. Very nice. Nine hours. Ouch! What size is your painting? Posted: Jan 07, 2013 06:00 Post subject: Re: 2013 Paint Off!!! Posted: Jan 07, 2013 18:42 Post subject: Re: 2013 Paint Off!!! Beautiful! It really has the distinct feel of impressionism. If I hadn't known that an impressionistic style was your intention, I would readily categorize it as such. You've created a pleasing balance of warm and cool colors in this painting. 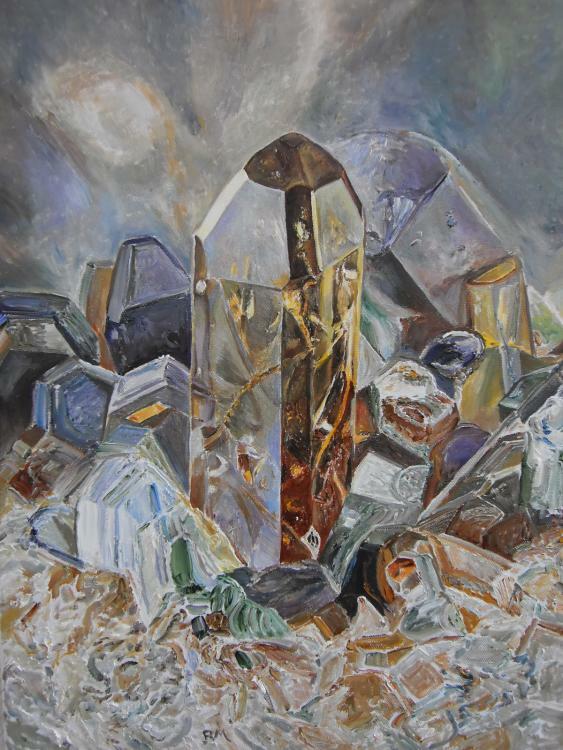 Are you the first to combine impressionism and mineral illustration? I've attached my progress so far. I'm a bit behind, but I hope this weekend I'll be able to get plenty of time in. 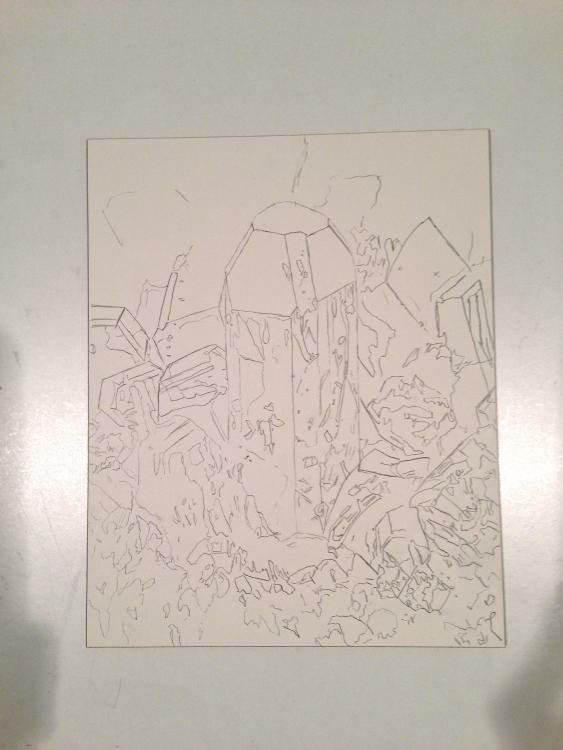 This is the 8"x10" clayboard, which is basically masonite with a thin coating of kaolin clay. I've penciled in the outlines and landmarks I am interested in. I guess I'll post photos of my progress as I go. Posted: Jan 08, 2013 07:40 Post subject: Re: 2013 Paint Off!!! thanks for your contribution. 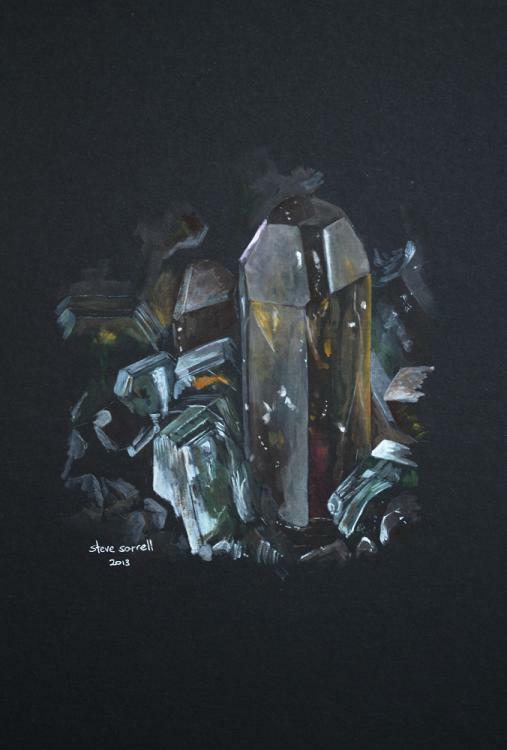 I also want to know, if there is another artist, who combines impressionism and mineral illustration. But until today I did'nt find one. I'm glad to see your first step of painting. I think the foreground is a hard part, because you dont't see a real object. I'm eager to see, how you solve the problem. I asked at Mineralatlas, if anybody would join our project, but there is'nt one. So we three are on our own? Posted: Jan 21, 2013 12:52 Post subject: Re: 2013 Paint Off!!! First progress photo. Slowly but surely.